Magnificent oriental carpets from the Palm Beach Rug Gallery, elegant period furniture from Butchoff, Wick and Olivier Fleury, antiquities from the Sands of Time and jewelry worth more than I will earn in a lifetime of labor in the wordyards were on offer at the Palm Beach Art, Antique and Design show Dec. 16 in the Dixie Avenue gallery space of the Palm Beach Show Group. It was a boutique show, a junior version of the big exhibition the group puts on annually in the convention center in February. Searching for the captivating, I discovered the work of two contemporary artists and one who founded an empire of design. All three share an aesthetic dialogue with their cultures. 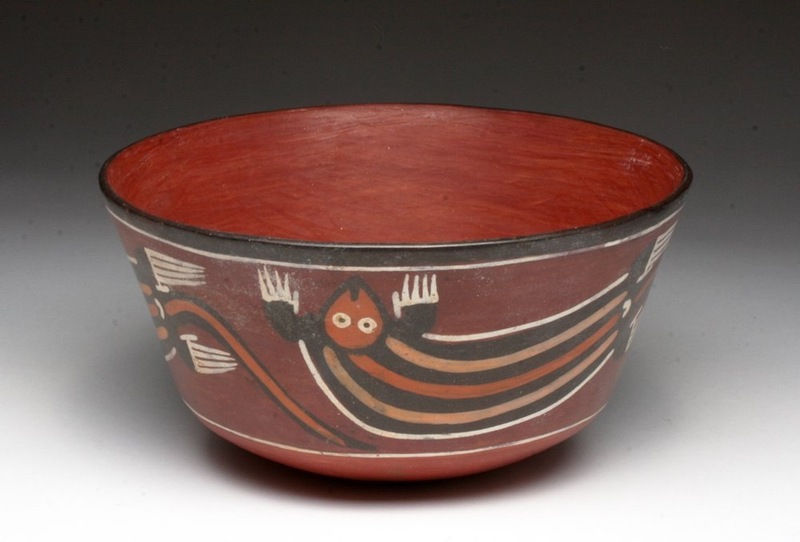 Terracotta bowl, Nazca culture, southern Peru (c. 350-400 A.D.), at Sands of Time during the Palm Beach Art, Antique and Design Show. The Bugatti name is well-known to connoisseurs of automotive and aero design, but only the cognoscenti may be familiar with the almost indescribable furniture-as-art pieces created by Carlo Bugatti during his lifetime. 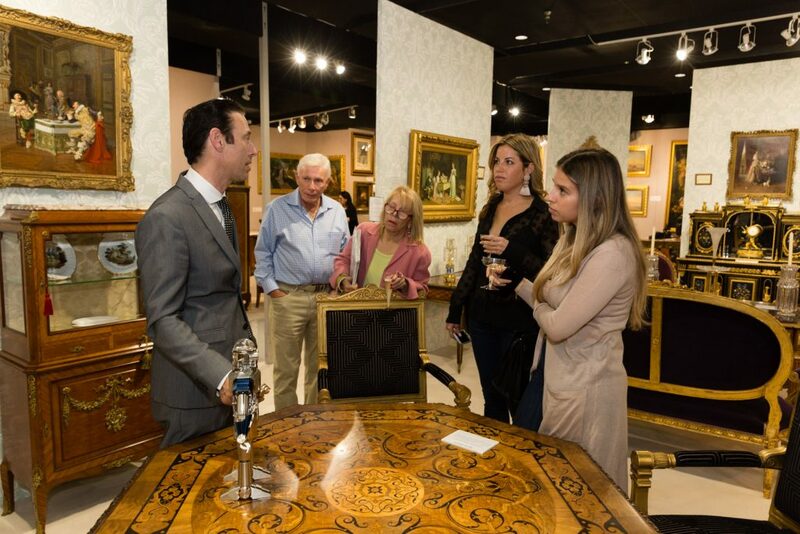 At the Callaghan Fine Paintings Gallery were two startling handmade tables and a “throne chair” crafted by Bugatti. 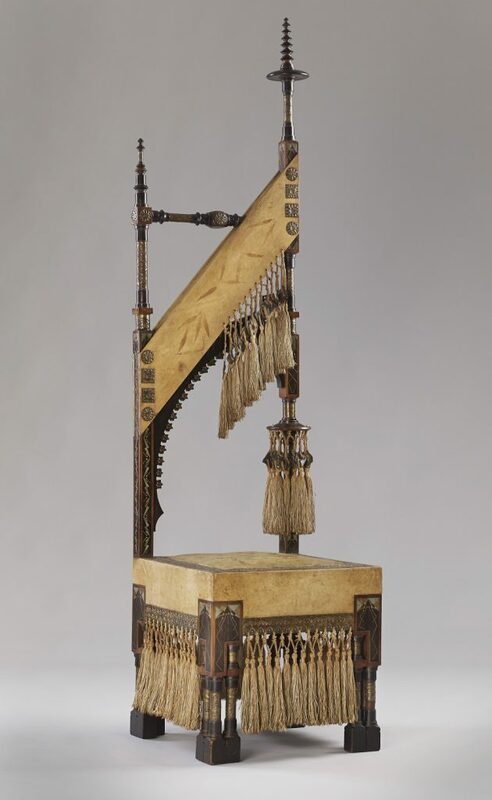 Walnut throne chair (c. 1902), by Carlo Bugatti. They are the closest thing to cultural simulacra I’ve seen in wood and other materials. That is, they seem to aggregate cultural referents and yet, they are sui generis. Bugatti’s artistic powers reached their peak in the early 1900s, but the work is not only collectible, it is useable and timeless. It was as if they had come from the royal palaces of a lost continent. All three on display are pieces that owe their heritage to the Art Nouveau period in Italy and are as much sculpture as furniture, combining natural and industrial forms incorporating such unusual materials such as parchment, mother-of-pearl, bone, ivory and pewter. At first glance, I felt as if I could identify their provenance — perhaps Oriental, perhaps Egyptian — but on closer inspection, it was clear they had sprung entirely from Bugatti’s inventive mind. 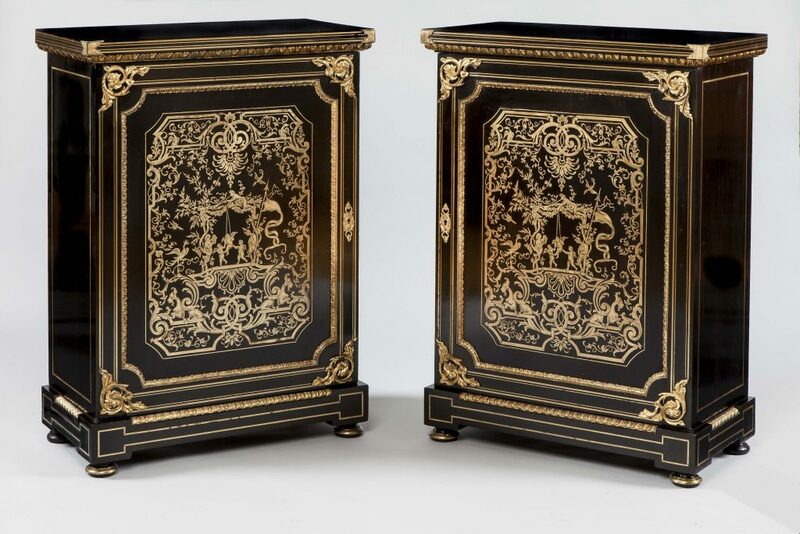 Side cabinets, French (1870), after André-Charles Boulle, at Butchoff Antiques, at the Palm Beach Art, Antique and Design Show. I talked with Dan Callaghan of the eponymous Shrewsbury galley in Britain’s Midlands who pointed out some the finer points of the furniture and entertained me with an oft-told story about the artist. Callaghan also showed a large painting by the Spanish contemporary artist Ignacio Trelis that was an illusion as well. Its powerful brushwork seemed to come from another century, yet the painter was born in 1960. 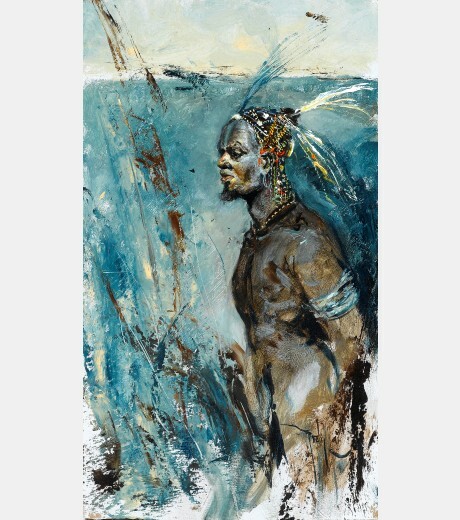 It is a full-length portrait that resembled a traditional blackamoor image but turned out to be an inference to an African shaman. Trelis had been a landscape painter of some note, but took to traveling the world to find mysterious figures of foreign cultures as subjects, not so much to capture them, but to suggest their essence. At the Smith-Davidson spot, I talked with Joyce Aerts and by phone with David Smith about the work of Paul Rousso, which also has an illusory presence. A North Carolinian, Rousso selects existing printed material, enlarges it, then prints it on a styrene basis. NYT Sunday Styles 12-20-15, by Paul Rousso. 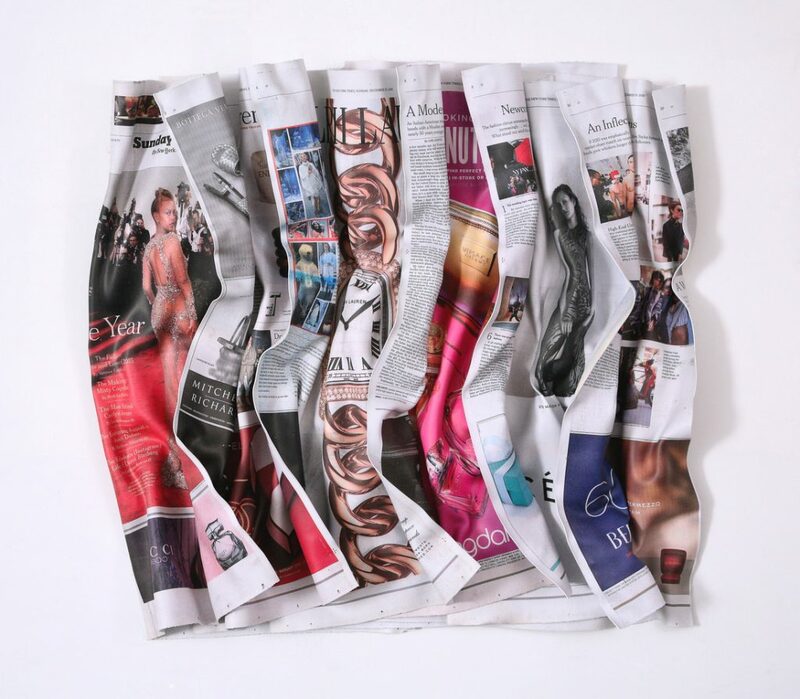 Using a blowtorch as a sculptural tool, the former art director and illustrator folds and crumples larger-than-life size pieces such as the Style or Arts and Entertainment sections of The New York Times in flowing waves. In a way it is manipulation of selected found objects. The impression is that of an all-thumbs giant reading the newspaper on the subway, wresting to fold it into readable shape. You can see his process on YouTube. The Gallery has exhibition space in Amsterdam and Miami and concentrates on contemporary work. Though each of these three artists represent different branches of the tree, all three are examining art as illusion. They remind me of Magritte’s taunting picture of a pipe captioned by the artist, “This is not a pipe.” All three are working with the paradox of representation.